world has seen, is best known through his rock edicts and the Pali chronicles of Sri Lanka, Mahaavamsa and Deepavamsa, of the 5th century A. D. These chronicles belong to the Theravada school of Buddhism and stress Ashoka’s role in propagating it by dispatching missionaries to Kashmir, Gandhara, the Himalayas, Maharashtra, Suvarnabhumi in South-East Asia, and his own son Mahinda to Sri Lanka. A very different Ashoka comes before us in the Sanskrit Ashokaavadaana, a 1st century A.D. work which was translated into Chinese twice: the A-yu wang chuan around 300 A.D. and the A-yu wang ching circa 500 A.D. It is essentially a Hinayana text and its world is that of Mathura and North-west India. A ship rolls to the wind’s force; so too the mountain-ranged earth begirt with the ocean and adorned with towns and villages, sways at the touch of the Sage’s foot. The ground becomes level; the earth becomes faultless, free of stones and thorns by the Buddha’s power. The blind, the dumb, and the dull all regain their senses and musical instruments play though untouched, delighting all. The citizens cheered the marvels with a roar like that of a storm-tossed sea with its crashing waves as the city was filled with the radiance of his presence. He saw the supremely compassionate self Existent Lord whose body radiated a halo a fathom wide; resolutely, with firm faith he offered a handful of dust to Him who abolishes birth and old age. The Buddha, understanding Jaya’s character and resolve and recognizing the sincerity of his aspiration, accepted the proffered fistful of dirt and smiled. A hundred years after my death there will be an emperor named Ashoka in Pataliputra. He will rule one of the four continents and adorn Jambudvipa with my relics building eighty four thousand stupas for the welfare of people. He will have them honored by gods and men. His fame will be widespread. His meritorious gift was just this: Jaya threw a handful of dust into the Tathaagata’s bowl. At this time, the King of Rajagriha was Bimbisara. Nine kings after him came Bindusara, who reigned in Pataliputra as the successor of Nanda.2 He had a son named Suseema. During his reign, a Brahmin of Champa city had a very beautiful daughter of whom the astrologers foretold that she would marry a king and have two famous sons, one of whom would rule over a whole continent while the other would turn to the religious life and attain liberation. When his daughter was of age, the Brahmin adorned her with all the ornaments he had and offered her in marriage to King Bindusara who accepted her in his inner apartments. The maiden’s beauty excited the jealousy of the queens, who feared that if the king took a fancy to her, he would never look at any of them. So, they taught her the barber’s art, and sent her to groom the hair and beard of Bindusara. So good was she in her work that he would relax and fall asleep during the grooming. Very pleased with her, Bindusara one day asked her what she would like most of all. She asked for a son. The king was astonished and exclaimed, “But how can I, a Kshatriya monarch, marry a barber girl!” “Your Majesty,” she replied, “I am not a barber girl, but the daughter of a Brahmin. My father gifted me to your highness as a wife.” Finding out who had taught her the barber’s art, the king passed orders that she would not do so any longer. Instead, as his queens had feared, he installed her as his Chief Queen. In due course, this chief queen—who goes nameless in the tale--gave birth to a son. When asked what she would like him named, she said, “When this child was born, I became ‘without sorrow’.” Thus, he was named A-shoka. Later, she gave birth to a second son, whom she named Veetashoka, since he was born when sorrow had ceased (vigate-shoka). Bindusara desired, one day, to ascertain which of his sons was best suited to succeed him as king. Summoning the wandering sanyasi Pingalavatsajiva, he requested him to test the princes. “Very well, your majesty,” said Pingalavatsajiva, “ go with the princes to the Garden of the Golden Pavilion, and I will examine them there in your presence.” Bindusara issued orders accordingly. But Ashoka sat, depressed and angry, in his mother’s apartments. She spoke to him, “ My son, the king has determined to examine all the princes and has proceeded to the garden of the Golden Pavilion. You should go there at once.” Ashoka retorted, “ Why should I? My body is unpleasant to look at; my skin is rough and the very touch of my body is distasteful to the king.” “ Go nevertheless,” advised his mother. Finally, Ashoka set forth, asking her to send him some food later in the day. As he was leaving Pataliputra, Radhagupta, the son of the prime minister, met Ashoka. Hearing of the test, Radhagupta offered Ashoka the old royal elephant on which he was mounted. Ashoka rode this majestic, venerable mount to the garden of the Golden Pavilion. Reaching it, he took his seat on the ground, while the others were seated on appropriate raised seats. Food arrived for them all. Ashoka’s mother had sent him boiled rice mixed with curds in an earthen vessel. Bindusara wanted the sanyasi to provide some more indicators. Then Pingalavatsajiva declared that he who had the best seat, the best vessel, the best food and drink would become king. When his mother asked about the predictions, Ashoka replied, “The prediction mentioned no name. It said that he who had the most excellent mount, seat, drink, vessel, and food will become king. The royal elephant’s back was my mount; the earth itself was my seat; my vessel was made of earth; boiled rice with curds my food and water my drink. Therefore I know that I shall be king.” Hearing this, and noticing that Pingalavatsajiva had begun to honor her particularly, Ashoka’s mother told the ascetic, “The king may some day suddenly question you further and press you for a direct answer on the succession. You had better seek refuge in the borderlands and return when you hear that Ashoka has become king.” And so, the wandering ascetic set forth and is not heard of again in our story. Some time later, the city of Takshashila rose in rebellion against King Bindusara who dispatched Ashoka to tackle it with a fourfold army of cavalry, elephants, chariots and infantry. But the king passed orders not to issue them any arms. The servants came running to the prince and informed him, “ Prince Ashoka, we don’t have any weapons of war. How shall we fight?” Ashoka declared, “If my merit is such that I am to become king, let weapons of war appear before me!” And as he spoke, the earth gaped open and divine beings rose out of it carrying weapons for his army. When the citizens of Takshashila heard of Ashoka’s approach, they decorated the road for several miles and went to welcome him with vases full of offerings. “O Prince,” they said, “we had no intention to revolt against you or the king. But evil ministers oppressed us and the tales of our miseries never reached Pataliputra. Hence, we had to rise and banish the King’s evil representatives.” In the same manner Ashoka was welcomed into the kingdom of the Khashas where two great warriors entered his service and thenceforth marched ahead of him, cutting a path through the mountains and proclaiming, “Ashoka will become a chakravarti monarch over one of the four continents. None is to oppose him!” Finally, the whole of the northwest, right up to the sea, submitted to him. Back in the capital, one day Prince Suseema, the eldest son of the king, was returning from a ride when he met the prime minister. In jest, the Prince slapped the venerable man on his bald pate and passed on. But the wise prime minister thought to himself, “Today he slaps me with his hand. When he becomes king, he’ll let fall his sword. I must ensure he does not inherit the kingdom.” He summoned the five hundred ministers of the king and told them, “It has been predicted by the holy ascetic that Ashoka will become a chakravarti ruling over one of the four continents. When the time comes, let us place him on the throne.” And they agreed. Soon the people of Takshashila rebelled once more. This time Bindusara sent Suseema, but he could not quell the rebellion. In the meantime, Bindusara fell sick. Hence, intending to install Suseema on the throne, he recalled him and ordered Ashoka to proceed to Takshashila. The ministers, however, thwarted this plan. They smeared Ashoka with turmeric, boiled some red lac in copper vessels and displayed it, saying that the prince was so ill that he could not move out of bed. As Bindusara’s condition worsened, the minister brought Ashoka before him, clad in all finery, and urged the king, “Consecrate Prince Ashoka for the present and we will install Suseema on the throne later, when he returns.” Bindusara’s wasted frame shook with fury as he refused. Then Ashoka declared, “If the throne is rightfully mine by fate’s decree, let the gods crown me with the royal crown!” At once heavenly beings manifested and placed the crown on Ashoka’s head. When Bindusara saw this, he vomited blood and passed away. 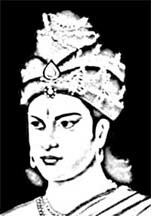 Ashoka’s first act as king was to appoint Radhagupta prime minister. Meanwhile, news of the coronation had reached Suseema in Takshashila. Furious at the usurpation, he rushed back to Pataliputra. Ashoka posted his two great warriors at two of the city gates. In front of the eastern gate, Radhagupta set up an artificial elephant so cunningly fashioned as to deceive a casual observer. On top of it, he placed an effigy of Ashoka, digging a ditch all around filled with live coals covered with reeds. The whole pit was camouflaged carefully. As Suseema arrived before the city, Radhagupta shouted tauntingly,” If you can slay Ashoka, the throne is yours!” That provoked Suseema to rush to the eastern gate to fight his half-brother. As he charged forward, he fell into the ditch full of live charcoal and died a terrible death. Having installed Ashoka, the ministers began to take him for granted, considering themselves the real power behind the throne and secretly contemptuous of the new king. This attitude was a hangover of Bindusara’s dislike of Ashoka because of his peculiarly rough and unpleasant looking skin. Ashoka was no fool. To test the ministers’ loyalty and to discipline them, he ordered that all flower and fruit trees be chopped down, but the thorny ones preserved. The obvious analogy with his “thorny” appearance escaped the over-confident ministers. “What is your majesty planning?” they queried, “Should not, rather, the thorny trees be destroyed and the beautiful ones preserved?” Thrice they avoided complying with the orders in this manner. Furious at his authority being flouted, on the fourth occasion Ashoka unsheathed his sword and beheaded the five hundred counselors. Once, Ashoka went strolling in a garden with his women. It was spring and the trees were laden with blooms and fruits. The king saw an ashoka tree in full bloom, and told his women, “See this is my namesake and how beautiful it is!” He wanted to be caressed by them, but the women disliked his rough skin and secretly mocked his comparing himself with the lovely tree. So, when he fell asleep, they decided to teach him a lesson. They got together, and removed all the flowers and leaves from the ashoka tree, leaving it bare and unlovely. On waking, Ashoka’s eyes fell on the ashoka tree, transformed from the ecstatic look of spring into the naked forlornness of winter. When he found out from his servants that his concubines were responsible, he was so furious that he had his five hundred women burned alive. Seeing these fearsome acts of the king, the people named him Chandaashoka, “Ashoka the Fierce.” was Anxious that the people should not turn away from the king in revulsion, Radhagupta the prime minister spoke to Ashoka: “Your majesty, it is unseemly for the monarch to work as an executioner. Why not appoint some royal executioners who will carry out your commands?” Ashoka saw the wisdom of this and asked that suitable persons be sought out. The first thing Girikaa asked of Ashoka, when he was presented to the king, was a building exclusively devoted to the art of execution. And so such a building was built, beautiful to look at from the outside, but housing all instruments of torture. People called it, “ the Paradisal Hell.” When it was ready, Chandagirikaa submitted to Chandaashoka, “Your majesty, grant me this boon: that whoever enters this place shall not leave it alive.” The king granted the request. Around this time, a Buddhist monk named Samudra arrived in Pataliputra. He was so named having been born when his father, a merchant, was sailing across the ocean. Having lost his father at the age of twelve Samudra had joined the Buddhist order. That morning in Pataliputra, he unknowingly stepped into the imposing mansion, “the paradisal hell” asking for alms. Once inside, seeing the dreadful sights, he sought to leave, but Chandagirikaa stopped him. “This is where your life ends,” said the royal executioner and was much surprised when the mendicant burst into tears. Replying to his query, Samudra said, “Kind sir, I grieve not for the destruction of this body, but for losing this hard-to-attain existence in which I have been instructed by the lion of the Shaakyas and was hoping to achieve liberation.” Samudra, begging for compassion, sought a month’s delay of the execution. Chandagirikaa granted him a seven-day reprieve; and so Samudra waited, wrestling with the fear of death. The body is as a foam-bubble, evanescent, worthless. Where now is that lovely face, that beautiful body? Only the ignorant delight in this impermanence. In this prison, I’ll cross the ocean of existence. Striving all through the night, Samudra broke through the bonds of earthly attachments and became an arhat, a liberated being. In the morning, Chandagirikaa strode up to him and said, “Monk, the night is gone, the sun is risen, the time of your torture has come.” Calmly Samudra replied, “True my night of ignorance has cleared and the sun of my good fortune is at its height. You may do as you wish, my friend.” Unmoved, the executioner threw Samudra into a cauldron full of water and blood, and tried to light a fire underneath. Try as he might, the fire would not blaze. Puzzled, he looked into the vessel and was amazed to see the monk sitting calmly on a lotus within it. He rushed to Ashoka who came to witness the miracle along with hundreds of people. Seeing the king, Samudra divined that the time had come for Ashoka’s conversion. Miraculously, Samudra floated up in the air and stunned the monarch. With folded hands, Ashoka begged enlightenment and initiation into the mysteries of the Dharma of Samudra. Samudra then told Ashoka how the Buddha had predicted that a hundred years after his demise there would be in Pataliputra a king who would distribute his bodily relics in eighty four thousand stupas. “Instead, your majesty,” said Samudra, “you have built this palace which is hell and where thousands are tortured to death. O king, grant security to all beings, for compassion is the highest virtue. Fulfill the lord’s prediction.” Begging forgiveness, Ashoka proclaimed his faith in the Buddha, in the congregation of believers (Sangha) and in his teachings (Dharma). He also promised to adorn the earth with chaityas housing the Blessed One’s relics. Samudra vanished; Ashoka, too, was about to leave when Chandagirikaa stopped him. “Your majesty, you granted me a boon,” he said, “that none would leave this place alive.” Ashoka was taken aback at the effrontery, and asked, “What! You want to execute me too!” “Undoubtedly,” replied the unruffled executioner. “But which one of us,” asked Ashoka, “entered this place first?” Chandagirikaa had to admit that it was he, so he was taken away to the death chamber, and the building was demolished. After Ashoka had accepted the teachings of the Buddha through Samudra’s miracles, he decided to distribute the holy relics throughout the country. The problem was that all the relics of the Buddha had been enshrined by Ajaatashatru (Bimbisara’s son who killed his father to become king) and seven other kings of that time in drona stupas. These were so called because each contained one drona (pitcher) of the relics. It is said in the Mahaaparinibbana Sutta that a ninth stupa was built by the Brahmin Drona (who had divided the relics into eight parts) over the drona used to measure out the relics and a tenth by the Moriyas of Pipphalivana over the embers of the cremation fire. Eight measures of relics there were of the far-seeing one, of the best of men. and one portion in Raamagraama by the Naga kings. Raamagraama had been washed into the Ganga. Ashoka managed to reach it and was respectfully received by the Nagas who showed him the drona stupa, but refused to part with the relics as they worshipped it. Ashoka, it seems, realized that he would never be able to match the Nagas in their devotion, and this is shown on the bas-reliefs at the Sanchi and Amaravati stupas. Fa-hsien and Hsuan-tsang relate the same story. According to the Mahaavamsa tradition, the Nagas told Ashoka that these relics had been set aside by the Buddha himself for Dutthagaamani, King of Sri Lanka (circa 101-77 B.C). However, the Sanskrit traditions tell another story. Ashoka, they say, found his way to the eighth stupa barred by a great wheel armed with razor sharp blades spinning in the river.3 He turned to a monk for advice, who told him to throw large quantities of plum into the current, which would jam the machinery. Ashoka did so and got past this obstacle only to be stopped by a huge Naga monarch guarding the relics. Once again, he turned to the monk who stated that only when his merit exceeded that of the Naga would he be able to pass safely. On the monk’s advice, Ashoka had two golden statues made of himself and the Naga King and got them weighed. To his consternation, the Naga’s statue turned out heavier! Yet again, the monk provided the solution: Ashoka must acquire greater merit. Ashoka had eighty four thousand boxes made of gold, silver, cat’s eye and crystal to house the relics, along with an equal number of urns and inscriptions. These he gave to the Yashas for placing in the stupas he built throughout the country wherever there were a lakh of people. Now, the people of Takshashila numbered 36 lakh and they petitioned Ashoka for 36 boxes. Ashoka realized that if he agreed to this the relics would not be dispersed as widely as he planned. Typically, he cut this Gordian knot by informing them that since he could afford only to give one share, he would have to execute 35 lakh Takshashilans! We hear no further of their insistence. Now Ashoka approached the elder Yashas, head of the Kukkutaaraama monastery, and expressed his desire to consecrate all the 84000 stupas on the same day, at the same time. Yashas agreed to signal the moment by concealing the sun with his hand. And thus, a solar eclipse signaled the momentous achievement, and the change of the king from Ashoka the Fierce (Chandaashoka) to Ashoka the Righteous (Dharmaashoka). One day the soothsayers in the court declared that Ashoka’s body bore certain inauspicious marks. To remove these he was advised to perform meritorious deeds. Ashoka approached Yashas and wanted to know why these marks persisted despite his having built eighty four thousand stupas as foretold by the Buddha. Yashas told him that thereby he had acquired merit only for himself, which was “lighter” than urging others to do good deeds. Hence, Ashoka disguised himself as a wandering mendicant and went from door to door for alms, because the giving of alms brought merit to the giver. One day he came to the ramshackle hut of a very poor widow who had nothing at all to give. Yet, seeing the opportunity to perform a good deed, she did not forego it. All she had was a single cloth she was wearing. Hiding behind the bamboo-matting wall of her hut, she held out her only covering. Profoundly moved, Ashoka presented her with a precious necklace and several villages. At another house, he met an aged and poverty-ridden couple who had nothing to give. But they exhorted him to wait, and went to a rich neighbor to borrow seven gold pieces, undertaking to become his slaves if they could not repay him within a week. This gold they gave as alms to Ashoka who gifted them clothes, jewels and villages. In this manner, Ashoka went round exhorting others to acquire merit. The inauspicious marks on his body disappeared. Now, in Ashoka’s palace lived a servant girl who was sorrowful for she thought that Ashoka had become so great because of the meritorious acts he had done in the past life, while her being destitute was undoubtedly the result of bad deeds in her earlier lives. She wondered how she would ever acquire merit, as she had nothing to give as alms to monks. One day, while sweeping, she came upon a coin in the garbage. Despite being so poor, she took it to the monastery and happily donated it. Soon thereafter, she died and was reborn as the daughter of one of Ashoka’s queens, with her fist tightly clenched. Ashoka opened it to find a gold coin. Every time he removed it, another appeared in its place! Ashoka reported this miracle to Yashas, who explained that this was the result of her having offered her only coin to the Sangha in her previous birth. This tale and that of the poor widow who gifts her sole garment remind us of Christ’s parable of the widow’s mite. Once, while going through his treasury, Ashoka came across a chipped gem. On making enquiries, he was told that it used to be part of King Ajaatashatru’s armour. It carried an inscription that incensed Ashoka: “Bequeathed to the poor King Ashoka who will reign in the future.” Furious, Ashoka asked his Prime Minister Radhagupta, “Ajaatashatru was a minor prince, while I rule over all of Jambudveepa. How could he call me poor?” Radhagupta suggested that the king test out the gem. It was found that anyone wearing it could digest poison. Ashoka then reflected that this chipped gem, which was a part of Ajaatashatru’s armour, was immeasurably superior to all that he had in his treasury. Indeed, he was poor compared to those who lived at the time of the Buddha and acquired unrivalled merit then. a young king, a young naga and a young monk. and the third, though small, can save mankind. Thereafter, Ashoka used to throw himself at the feet of Buddhist monks regardless of the place and the people watching. His minister, Yashas, found this inappropriate and told him,” Your majesty, you ought not to prostrate yourself before wandering monks, for Buddhist monks come from all castes.” Ashoka did not respond immediately. A few days later, Ashoka called his ministers and told them that he required the heads of different types of animals. Knowing his violent temper (he had executed many ministers in the past) they did not ask him why he wanted these but each of them quickly went about procuring the type of head specified by Ashoka. Yashas was asked to bring a human head. that none on earth would take it. Even though he dispelled with the lamp of perfect knowledge the darkness of his mind, he never preached two words to anyone as others did for the benefit of mankind. Thus, though Batkula lacked desires, he also lacked the purpose to serve humanity. Lord’s tree dies, I too shall surely expire! Tishyarakshitaa, seeing the king sorrowing for Bodhi, told him, “My Lord, what if Bodhi should die? I am still here to bring you pleasure.” “Foolish woman,” retorted Ashoka, “Bodhi is not a woman, but the tree under which the Blessed One attained complete enlightenment.” Realizing her mistake, the queen asked the witch to restore the tree, and this was done after the thread was untied and the tree watered with a hundred jars of milk a day. And attaches you to many sufferings. as a forest fire burns kindling. Kunaala was horrified, and begged her to shun the evil path. Tishyarakshitaa, enraged at being spurned, schemed to destroy the prince. It so happened that the city of Takshashila rebelled and Ashoka sent Kunaala there, recalling how his father had sent him there in the past. The Takshashilans welcomed the prince and said they had been forced to rebel against evil ministers. Back at the capital, Ashoka had fallen very ill and wanted his son back, to be crowned as he was despairing of recovery. Tishyarakshitaa hearing this was worried, fearing death at Kunaala’s hands if he became king. Hence, she persuaded Ashoka that she could cure him provided he forbade all the doctors from treating him. Then she ordered the physicians to bring her anyone they found to be suffering from the same symptoms as the king. A few days later, a doctor brought such a person to the queen. In secret she had him slain, and examined his stomach where she found a large worm. She then experimented with various medicines and found that onions killed it. Tishyarakshitaa then told Ashoka that he must eat an onion to recover, overruling his objections by pointing out that this was a medicine to save his life. Ashoka recovered and in joy granted her a boon. The queen requested the grant of sovereignty for seven days. Ashoka was worried. What would happen to him, he wondered. Tishyarakshitaa reassured him that she would return the throne to him thereafter. A second time he awoke in cold sweat, exclaiming, “I saw Kunaala entering the city with a beard, long hair and long nails.” “May the prince be well,” said the queen, and again he slept. This time she managed to get the impression of his teeth on the letter and sent it off to Takshashila. When he had found out that this was the work of Tishyarakshitaa, he blessed her and wished her long life, for she had brought about his enlightenment. When his wife lamented that the eyes which brought her joy were gone, he told her not to weep, for separation from dear ones and suffering was the way of the world and mankind was made up of sorrow. Ashoka, however, persisted and found out that this was the work of Tishyarakshitaa. Summoning her he raged, “First I'll tear out her eyes and then I think I’ll rip open her body with sharp rakes, impale her alive, cut off her nose with a saw, her tongue with a razor and fill her with poison.” Such and other ways he spoke of for her execution. But Kunaala urged him, “If Tishyarakshitaa’s deeds were not honorable, let not yours be like her. Kill her not, for the reward of loving-kindness is unparalleled, and forgiveness was extolled by the Buddha. O king, I feel no pain for there is none in my mind. I have only kind thoughts for her and if this be true, may my eyes be restored!” As soon as he said this, Kunaala's sight was restored. But Ashoka did not forgive his queen. He threw her into a lacquer house and burnt it down over her. He had the citizens of Takshashila executed too. Some monks asked Upagupta, the sinless Buddha, why Kunaala had to suffer thus. Upagupta told them that in a past birth Kunaala had been a hunter of Varanasi who had come upon a herd of five hundred deer in a mountain cave and had trapped them in a net. Realizing that if he killed them all the meat would rot, he hit upon the idea of blinding them, so that they could not run away. Because of this, he was reborn many times and lost his own eyes each time. Again, many aeons ago a king had built a stupa for the Buddha Krakucchanda, which was stripped of its jewels by his successor. Seeing this, the son of a businessman completely renovated the stupa and set there a life-size image of that Buddha. He then made a resolute wish to meet a master like Krakucchanda. Because he rebuilt the stupa, he was born as a royal prince. For installing the image, he became the good-looking Kunaala. And because of his vow, he was worthy of Lord Shakyamuni, the Buddha, through whom he attained enlightenment. Continued to "Ashoka's Last Gift"
information provided in article is great work. we can not do anything but than you for providing plain sailing realities regarding the time of Ashoka, the brightest star of India. we were always feigning the dearth of sources and material for the mentioned period, but people like you facilitate the lives of others, thanks. I am working on a piece about Ashoka right now, a piece of work that has been simmering in my heart for over a decade. I am neither scholar nor historian -- just a creative writer in love with ancient India. I would be grateful if you would reply to me -- my email address is: miraprabhu@gmail.com. thank you for very good story. very informative. history books do not give true picture fo ashoka.